At NeuroVisual Specialists of Florida and iSee VisionCare, we know that you want optical solutions that work for your look, your lifestyle and your budget. That’s why we spend time with you going over your options and helping you pick just the right lenses. The staff at NeuroVisual Specialists of Florida and iSee VisionCare is experienced and adept at helping our patients pick out the right frames for them. We carry an extensive line of frames from the top brands, as well as special aligning prismatic lenses to treat eye misalignment and headaches related to eye movement. After we conduct a comprehensive vision test, we will discuss all of your options for corrective lenses. If you elect to wear glasses, we can help you pick out the right frames based on your face shape, your lifestyle and your budget. We offer frames for adults and children. Dr. Erin Sonneberg, OD, has many of years of experience fitting patients with the right contact lenses. She has extensive knowledge of how to assist patients with hard-to-fit lenses such as bifocal contacts and monovision lenses. Dr. Sonneberg also fits rigid gas permeable contacts as well as lenses for cosmetic purposes. If glasses are not for you, we will perform a special contact lens exam. During our evaluation, we will measure your cornea and assess your tear film. The results will help us find the pair of contact lenses that are perfect for your eyes and your lifestyle. You want to look good and protect your eyes on sunny days. While bright days call to us all, it’s important to consider the dangers of harmful UV rays and glare to the eyes. That’s we offer the very best in prescription sunglasses. 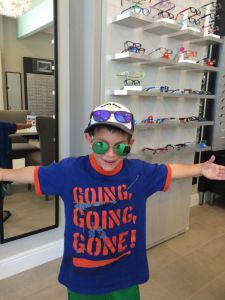 NeuroVisual Specialists of Florida and iSee VisionCare offers a full range of optical solutions for the entire family. If you’re in need of new frames, contact lenses or would like a LASIK referral, call us today at (561) 733-9008 or contact us online.